* Br J Nutr, 2001; 86(2):291-300. J Nutr, 1997; 127(1):130-6. Mindell E, What You Should Know About Fiber and Digestion, 1997. 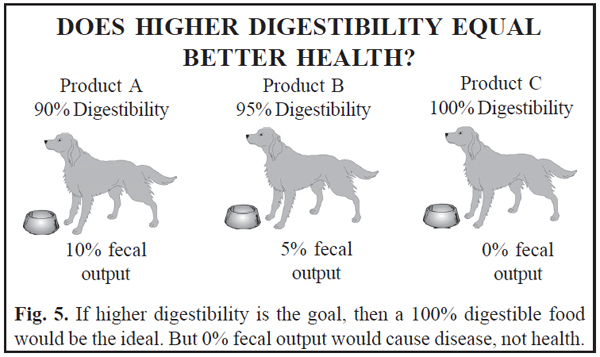 Additionally, there is no generally accepted method for determining digestibility. * Such disagreement usually results when understanding is poor. Now then, if digestibility expert "A" disagrees with digestibility expert "B" and vice versa, we can disagree with them both and have the backing of an expert. Digestibility tests attach simplicity to that which is incredibly complex. Measuring how much is absorbed compared to how much is lost or excreted says nothing about the merit of what is absorbed. Nutrition is a tissuelevel biochemical phenomenon, not a simple subtraction between what is eaten and what is excreted. * Anim Feed Sci Technol, 2001; 89(1-2):49-58. J Dairy Sci, 2000; 83(10):2289-94. Tufts University Diet and Nutrition Letter, May 1994:5. Current regulatory emphasis is on feeding trials, since some animals fed foods meeting NRC analytical guidelines suffered nutrient deficiencies. However, such deficiencies have also been experienced by use of pet foods which have passed AAFCO feeding trials (see Proofs, pages 74-85). 1. Wysong Health Letter, "Don't Let Apparently Youthful Health Fool You," 7(12):6. J Am Coll Cardiol, 1993; 22(2): 459-67. J Am Med Assoc, 1999; 281:727-35. 2. 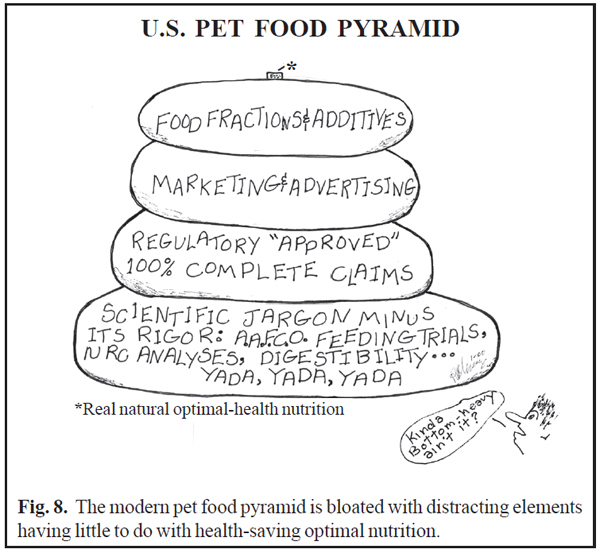 Pottenger FM, Pottenger's Cats: A Study in Nutrition, 1983. Price W, Nutrition and Physical Degeneration, 1982. 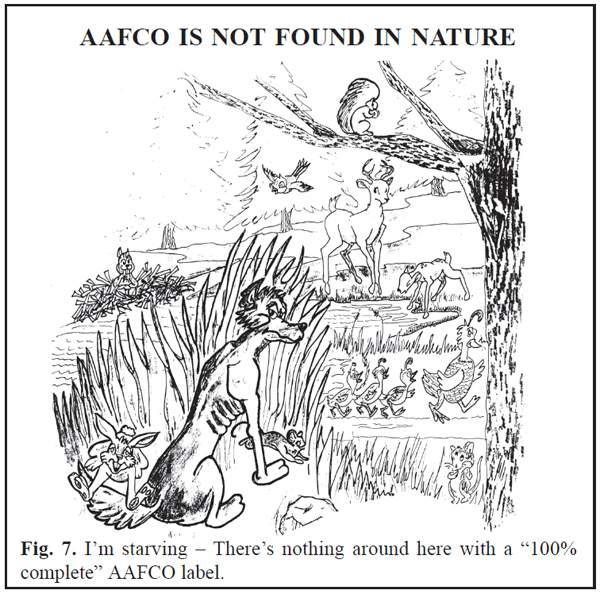 An AAFCO feeding trial requires a manufacturer to send food to a laboratory where it is fed to caged laboratory breeds for a period of 10- 26 weeks. Hair coat, weight, body measurement, and color of the blood are then analyzed to determine nutritional perfection –"100% completeness. "* It is like trying to measure the length of a virus with a yardstick. Such general measures do not fully reflect either nutritional adequacy or long term optimal health. "Caged" human prisoners of war have survived for years on little more than water and rice. Survival, or passing crude measures of nutrient deficiency, do not equal nutritional "completeness" (perfection). 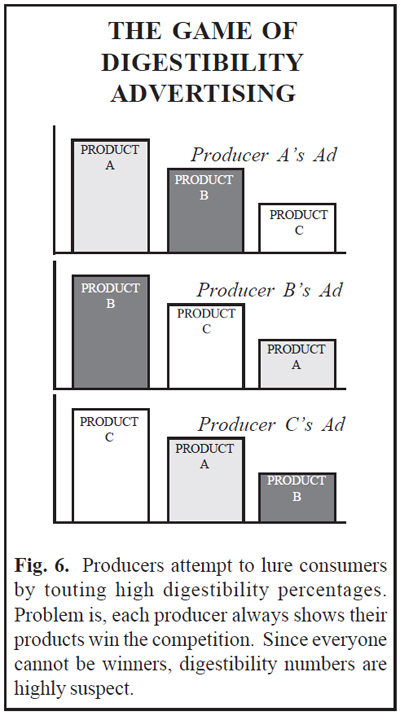 * Association of American Feed Control Officials, 1998 Official Publication. Additionally, results from an unfortunate laboratory-bred puppy living on concrete or in a stainless steel cage, under fluorescent lights, breathing conditioned air, do not correlate to real animals in homes and back yards. Obviously not. 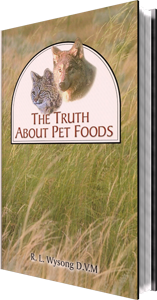 If feeding trials worked, thousands of cats fed feedingtrial- proven diets with "100% complete" claims would not, for example, have died from taurine deficiency (see Proofs, pages 74-85). None of this speaks to the unnecessary cruelty of imprisoning animals for months and years for feeding trials used to perpetuate a mythology. Nutrient analyses (reflected as "Nutrition Facts" on labels) can only prove that foods contain nutrients at levels that regulatory agencies say are necessary for the food to be "100% complete." Again, since no one knows what "100% complete" is, proving that a particular nutrient reaches a certain level is meaningless in terms of actually achieving optimal nutrition. Properly analyzed diets meeting guidelines have caused severe deficiencies (see Proofs, pages 74-85). Measuring a food's merit using NRC levels such as percentage of protein, fat, fiber, ash and about a dozen vitamins and minerals tells only a partial story. There are over forty essential nutrients known and over fifty under investigation. How can making sure a food contains the appropriate amounts of only a dozen nutrients merit a "100% complete" designation? What's more, testing to establish minimums is cursory and haphazard at best. For example, in the cat, phosphorus and manganese were NRC tested directly, but sodium, chloride, iodine, copper and selenium levels were merely extrapolated from values in other species. * In other words, a "100% complete" diet for cats could be based on something like sodium levels for aardvarks and selenium levels for newts. Maybe those aren't the species used, but no matter. An extrapolation is a guess regardless, and does not add up to "100% complete." If producers wish to claim their food is X% digestible, or that it contains certain amounts of nutrients, or that it has been subjected to a certain feeding trial, that is fine. But don't you believe it when they take an incredible leap (actually a fall) in logic and then claim their food is "100% complete and balanced." It's like me claiming that because I can jump over the couch I can also jump over the moon. Analyses, digestibility studies and AAFCO Feeding Trials are a futile life-support system for the hopelessly terminal "100% complete" claim. Don't be deceived. The "100% complete" claim is not good science. It is a shameless attempt at credibility by mere fraternization with the distinguished coattails of science. If science is the sun, the "100% complete" claim is Pluto. Reliance on such dubious information distracts from important issues of natural nutrition and simply builds reliance on commercial interests. I have not mentioned the waste of hundreds of thousands of dollars spent by manufacturers on testing and licensing to be able to make the "complete and balanced" claim. A huge regulatory and laboratory industry now exists to assure the perpetuation of the "100% complete" myth. Who pays for this? You do. This deceptive myth occupies an increasing economic space in your can or bag of pet food. * J Nutr, 1996; 126(9 Suppl):2377S-2385S, 2452S-2459S. Pediatr Clin North Am, 2001; 48(2):401-13. Ann N Y Acad Sci, 1975; 246:237-48. Cancer Res, 1992; 52(7 Suppl):2067s-2070s.